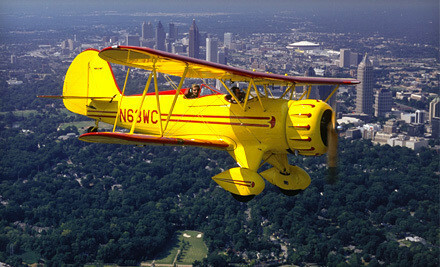 Groupon has a deal going for a downtown Atlanta Biplane ride. Fun!! Ok. Time to dust off that bucket list and scratch off an item. Groupon has a biplane ride over downtown Atlanta deal going at the moment. $87 per person. Ride around downtown, or over Stone Mountain. Your choice. The rides are usually at sunset. What a great way to see Atlanta! Hurry, though. As of publishing you only have about 5 days left to get the deal. You actually have a year to redeem. If you want to go Saturday, make your reservations early. First: How about some good coffee and pastry for breakfast? Empire State South never disappoints. Take a seat at one of the tables outside. Have the daily quiche, and a cup of coffee. So good. $6 per person. It's goin' down at Harmony Park starting at 10. Third: Nap time. Rest up for your biplane ride. Fourth: Time for the biplane ride. It's the best 20 minutes you'll have all month! $87 per person. Finally: Go celebrate your triumphant flight in style. Try out Restaurant Eugene for a late dinner around 9. Eugene is consistently celebrated as one of the best places in town. With James Beard-award winner Chef Linton Hopkins at the helm, it's no surprise. The chef's tasting is usually a fantastic bet. Seven delightful courses of inventiveness. It's a blast. Now, it's pretty pricey. So be prepared. But, it's a great way to end your bucket list day. $120 per person, with tip and wine. Don't forget to make a rez. Today's full day plan can take up to about 35 miles of driving, if your home base is midtown Atlanta. In fact, it's a rare one where you could probably get around with taxi alone for not much dough! The 35 miles equates to about 24 pounds of carbon dioxide, or the carbon sequestered by about 5 sq feet of forest. Calculations are based on the U.S. EPA's green house gas equivalencies calculator.